Upon entering the website, you'll get to a colorful page right away. The site is easy to use, and you can make a purchase and reach the purchase explanation pages easily, a function we appreciate. Albeit the site's intuitive flow and ease of use, we found it is a bit messy, and we would recommend them to organize the headlines at the beginning of each page to make the site even more user-friendly and convenient. The major thing that stood out like a sore thumb for us was the testimonials at the bottom of the front page are poorly written, and it seems like nobody bothered to proof-read before uploading them to the site. We couldn't help but wonder if these testimonials are actually fake. Furthermore, the mobile site is completely messed up - the main section is out of page borders, and the main menu isn't accessible when scrolling down. It looks like bad decisions were made when designing their mobile site version. Compared to competitors, this supplier has high prices. Even when you choose to buy their package deals, the price is still very high compared to the competitors. Although the services that they provide are good quality services, the prices are still unjustified and we can see potential customers clicking out of the site as soon as the lay eyes on these numbers. The payment options that subpals.com offers are varied – You can pay with your credit card, PayPal, Bitcoin (and other altcoins), and Paymentwall (gift cards). This is always a good thing. If you will want a refund, this supplier's refund policy is quite clear (to say the least!) - you get a full refund within three days, after three days your account needs review and after seven days you no longer eligible for a refund. We were pleasantly surprised by the delivery time that subpals.com offered. The delivery time was okay and perfectly average (not too fast and not too slow) for all services. Most competitors will lean towards one extreme or the other but these guys were somewhere around the middle. We ordered 1000 units, and subpals.com provided us the orders within a day and a half. If it was a bit slower, it could have been better, and then we'd give this vendor 80/100 points on their delivery speed alone! Most of the services didn't drop, except for likes. We have ordered a big order of "likes," and all of them dropped. We've experienced drops with other sellers as well, but never anything so drastic as this - every single like we have ordered was gone in the blink of an eye. So, unfortunately, we would not recommend ordering their likes service because it's useless. The website has a detailed FAQ page, which contains tons of information. For most of the questions we had, we received an immediate answer on this page which was great. 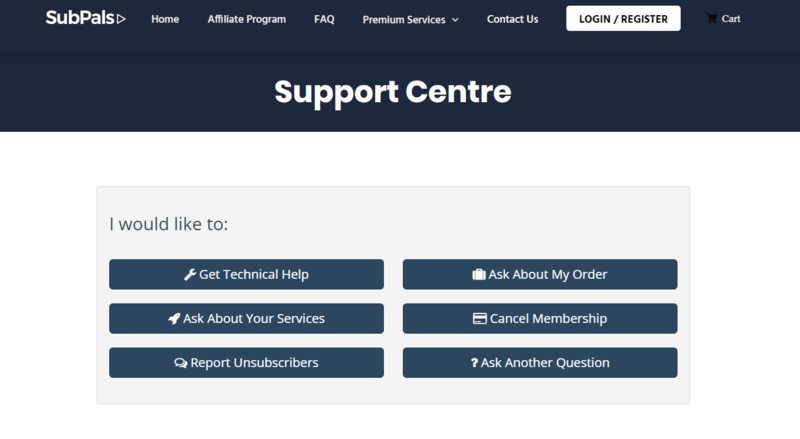 Aside from the FAQ page, there is a contact option. When we wanted to ask a question that is not part of the usual questions, we had to go through several steps. We found it quite annoying since all we really wanted was a simple answer and we had to jump through hoops and bend over backwards for it. So unnecessary. Subpals.com's services description is quite accurate. Their free sub4sub works pretty well; you can gain from it if you have a small and growing YouTube channel. 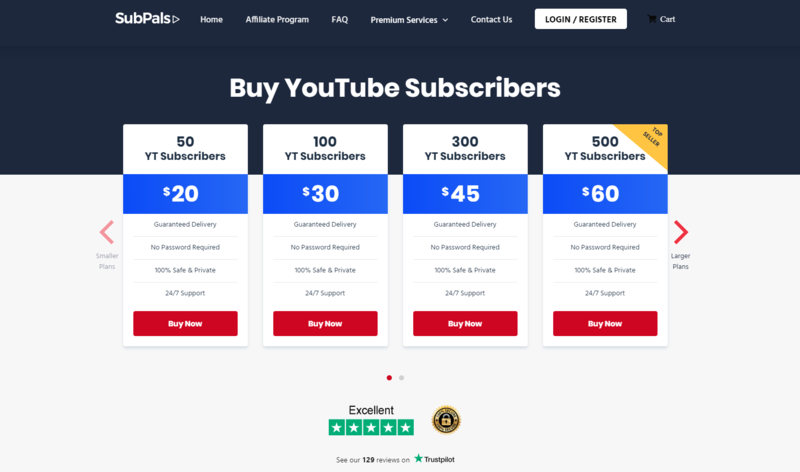 The advanced sub4sub plans are costly and in high volumes can be a bit risky when it comes to YouTube's terms of service. 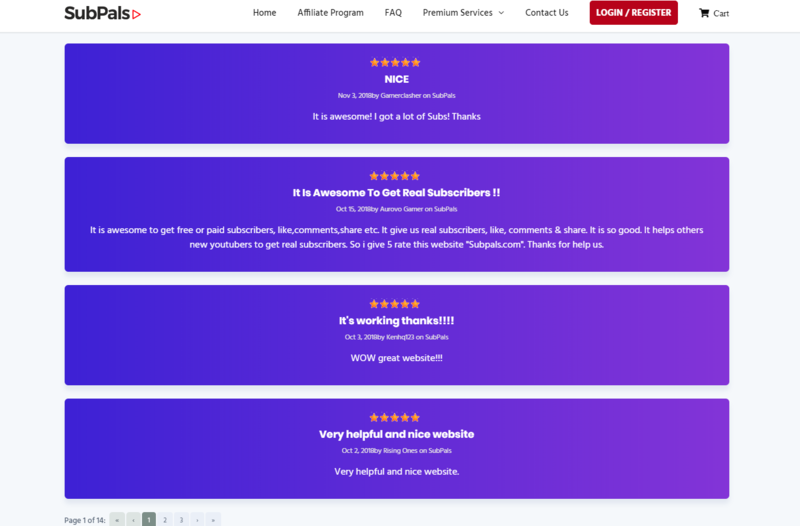 Their premium services are okay (subscribers, views, and likes), and as we mentioned before the delivery time was fine, a bit too fast and we had experienced massive drops only with the likes. Overall, the service description is realistic. We will give subpals.com 75/100 points, which isn't a horrible score but we feel like they could have done so much better. If their pricing had been cheaper and made sense (this isn't a luxury product you're offering, it's YouTube promotional services! ), and all the orders we had made had been delivered on time without any drops (not to mention that one of our orders mysteriously disappeared for no reason), they definitely could have received a higher ranking. At the end of the day, their services are okay but aren't that special for them to demand such exaggerated pricing rates and we felt a little disrespected with the way they handled our dropped likes.